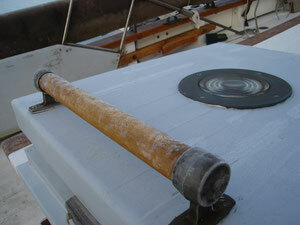 We're not complaining about the many hours of sunshine, the many windless days, the next-to-nothing rainfall – but Holey Ships, it can be cold! While the sun was starting to rise earlier, the nights just seemed to be getting colder and one time we even recorded -3ºC! The mornings we would spend inside thanking our good fortune for being on a pontoon with electricity to plug our fan-heater into. And in the afternoons we would slowly venture out into the fresh air and start stripping off several layers of clothing and enjoy the warm sunshine. 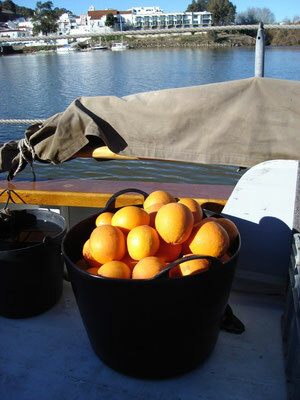 Meanwhile river life went on with boat jobs (albeit no varnishing because of the temperature), lots of marmelade making with all the wonderful oranges, lemons, limes and tangerines, Spanish classes and the odd party. One evening we attended a Fado night organized by the Alcoutim library. Not having heard much Fado singing before, we were quite curious. Well, we now can say Fado isn't really our kind of music, but it was interesting to listen to and watch the performers and we did enjoy the way how it turned into a kind of jam session with several people from the public getting up to take part. 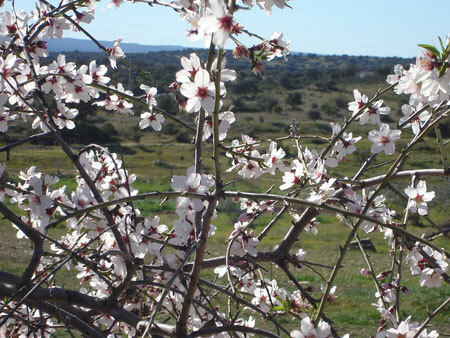 And to compensate for our lack of cultural happenings as opposed to last winter in Cartagena, we often went for a walk in the hills, admiring the first flowers and blossoming almond trees. And meanwhile we were starting to plan our departure from Sanlúcar, our way out of the Guadiana and across the shallow bar, a 30 mile sea journey, and another bar crossing into the Ria Formosa. 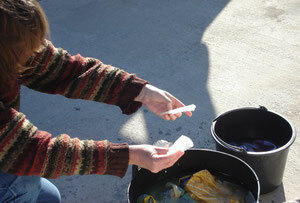 All this because we had an appointment at the shipyard in Olhão for the 20th of February. We had been studying the tide tables already many weeks in advance to figure out when to travel. On accuweather.com, who give a weather forecast for a month ahead, we saw how from the 14th onwards the steady NE-lies would making place for Westerlies (= contrary) and rain! After many years of sailing without a fixed schedule this was making me quite nervous! However, the change in the weather kept being postponed further and further, and when we left our winter berth the sun was shining as bright as it had been doing these past months.